AdPlexity Native is one of the biggest mobile ad spy tools currently out there with support for 38 ad networks and 89 affiliate networks. They have 1 subscription plan for $199 per month. Use our AdPlexity Native coupon code below to get 25% off your monthly subscription. Use our exclusive coupon to get 25% Lifetime Discount on your AdPlexity Desktop subscription. Normal price is $199 per month. Using our coupon you get it for only $149, that’s 25% Off! Use our exclusive coupon to get 25% Lifetime Discount on your AdPlexity Mobile subscription. Use our exclusive coupon to get 25% Lifetime Discount on your AdPlexity Native subscription. Normal price is $249 per month. Using our coupon you get it for only $199, that’s 25% Off! 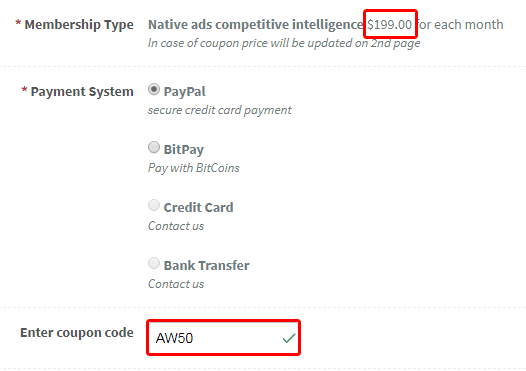 See screenshot below on how to apply the coupon. Adplexity Adult is the the best adult ad spy tool available today. You can find popular Banners and Landing Pages across all major traffic sources. Normal monthly subscriptions are $199/month. Use this coupon to get $50 off your monthly subscription (forever, as long as you stay a member). ★ Analyze campaigns from 70 Countries and over 120 Carriers! Adplexity Desktop is the the best desktop ad spy tool available today. You can find popular Banners and Landing Pages across all major traffic sources. Use this coupon to get $50 off your monthly Adplexity subscription for life. Use this coupon to get $50 off your monthly AdPlexity Native subscription for life. Mobusi, YeahMobi, Glispa, ClickDealer, Mundo Media, Mobvista, Avazu, Bruce Lead, Big Bang Ads, AppFlood, ZinQ Media, Wadogo, SpykeMedia, Neverblue Motive Interactive, ClicksMob, Taptica, Digital Virgo, Mobobeat, MPIRE Network, MobPartner, Art of Click, Matomy Market, Tapgerine, Bidder place, F5 Media, YepAds, Adsimilis, Adxmi, Adaction, RewardsAffiliates, FrontLeads, Fluent, ClickSure, Performance Revenues, Advidi, ArabyAds, Neomobile, Buongiorno, Adperio, Insparx, Mobisummer, Brus Media, GoWide, Crobo, WapEmpire, Blind Ferret Media, Blackfox.io, Peerfly, SevenGames Network, MobileTraffic.de, Affiliaxe, Say CPA, Aragon Advertising, W2Mobile, MaxBounty, CPAGrip, TheMobiAdz, Convert2Media, Sekomedia, Kiss My Ads, Adintop, BOAElite, Clariad, ReflexCash, Oasis, ClickBank, Ad4Game, vCommission, Arkeero, PromoRich, RevenueGiants, Affiliati, UniLead, King.com, Ad Bazaar, Inflecto Media, RevenueLook, RainyDayMarketing, mXpresso, Mobave, AboveAllOffers, MarketHealth, Tamome, Adzone Media, KobiDigital, AffOcean, HealthBeauty, ExpertMobi.